New data from YouGov Plan and Track confirms what various media outlets are reporting: Lululemon is doing well with men. “Men's is one of our largest and most exciting areas of future growth, both for our current and new guests going forward,” said Lululemon CEO Calvin McDonald during an earnings call last month. Indeed, since January 2016, when 5% of US males ages 18-49 aware of the brand said they were open to shopping at Lululemon when next on the hunt for clothing and accessories, that percentage has more than doubled to a recent high of 13%. 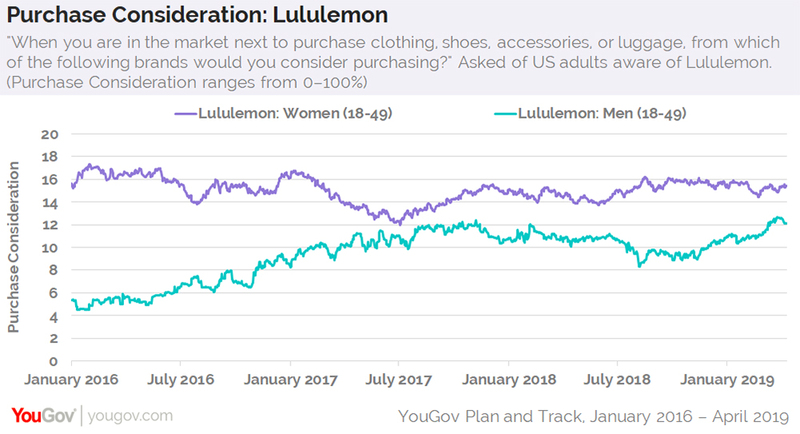 Meanwhile, interest in purchasing an item from Lululemon among US women ages 18-49 aware of the brand has never drifted too far from 15% throughout the same time period. Last month, Lululemon reported a net revenue of $3.3 billion for fiscal year 2018, up 24% from the previous year. Additional YouGov figures show that nearly two-thirds (65%) of current and former Lululemon customers fall between the ages of 18-49. Women account for 63% of this consumer group, while men make up the other 37%. Overall, 64% of current and former Lululemon customers say they keep up to date with current fashion trends, compared to 37% of the general public. Furthermore, 62% say people tend to ask them for advice before buying things, while the same is true for 41% of all US adults. In November 2017, YouGov data found that a growing number of men considered Lululemon a quality brand, especially after it had launched its first global campaign aimed at male consumers.